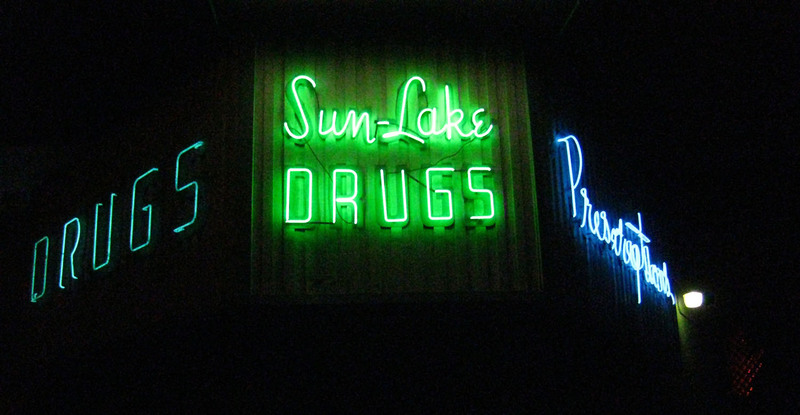 For the last couple years (at least), every time I’ve passed the Sun-Lake Pharmacy’s neon at night it’s been off and I grumble to myself about what a shame it is that it’s not blazing bright on the corner of Sunset Boulevard and Parkman in my section of Silver Lake. See, I’m one of those who thinks it should be a fineable offense to neglect neon signs. Anyway, I’m not sure the occasion, but biking home tonight from work I was pleasantly amazed to see it shining in all its glory, and so of course I stopped, busted out the cam and snapped me a shot for posterity. This entry was posted on Tuesday, January 5th, 2010 at 11:23 pm and is filed under neighborhood, photography. You can follow any responses to this entry through the RSS 2.0 feed. Both comments and pings are currently closed.